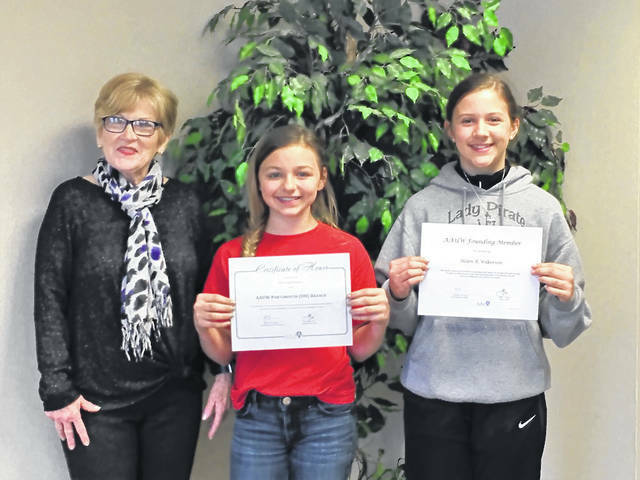 Two Scioto County junior high school girls were selected by the local American Association of University Women to receive Science, Technology, Engineering and Math (STEM) scholarships to Denison University in Granville. Olivia Deacon and Paige Martin were awarded full tution scholarships to attend a week-long residential camp in central Ohio. The scholarships are a collaborative effort between AAUW and the Southern Ohio Medical Center’s Development Foundation. SOMC, an annual participant in the Scioto Foundation’s “Scioto Gives” program, makes the collaboration possible. “Scioto Gives” is a one-day matching gift program for local non-profit organizations. Through this shared endeavor, at least one AAUW Be WISE scholarship is awarded annually. This STEM scholarship is designed exclusively for girls in the sixth or seventh grades who will be entering the seventh or eighth grades in the fall to encourage careers in science, technology, engineering and math. Deacon is a seventh-grade student at Wheelersburg Middle School who received a STEM scholarship from AAUW last year as a sixth grader. Martin is a seventh-grade student at Minford Middle School who is receiving the prestigious award for the first time. Deacon and Martin will spend one full week at Denison University exploring physics, chemistry, ecology, astronomy, economics, engineering and technology, and even become part of a research and development team to design and construct a product. But the week-long hands-on camp is not all academics. It also includes the use of the university swimming pool, field games, coding, and a wide variety of fun and relaxing activities. Girls attending the STEM camp not only gain confidence in science, math, technology and engineering, but they also develop life-long comaraderie with like-minded girls from around the state. A separate STEM curriculum is designed for each grade level, allowing junior high school girls the opportunity to explore a comprehensive STEM program when they attend both years. The curriculum goal of both grade levels is to enhance problem solving and critical thinking skills. Scholarship winners who attend the camp during the two summers of their junior high school years will not only experience the full STEM program, but also forge friendships over the course of two summers. The girls sleep and eat in the college dorms, learn in modern science labs, and use campus recreational facilities. They experience dorm life and are under the supervision of accomplished counselors who are former campers. The adolescent girls spend four hours per day in classes taught by females in STEM fields who serve as role models. AAUW/Portsmouth has been providing STEM scholarships to area junior high school girls for more than a decade. Over the years, those applying for AAUW’s Be WISE scholarships have soared academically, on the field and in their communities. As a result, many Be WISE applicants have attended the STEM camp for two consecutive summers. To learn more about the scholarship for summer 2019 or for questions about the scholarship or AAUW, contact an AAUW member, email reiser_sandra@yahoo.com or call 740-354-2909 or 740-352-4424.